For this week's Rewarding Times offer we have teamed up with Beeftro restaurants. You can enjoy a 3 course dinner for two people with a bottle of wine or prosecco at Beeftro, Balfe Street (Opposite the Westbury Hotel) including tea/coffee for only €69. As one of the best steakhouses in Dublin, Beeftro aim’s to bridge the gap between laid-back bistro dining and steakhouse meaty goodness. Beeftro has nudged its way in with a relaxed restaurant that prides itself on serving the best steak in Dublin. 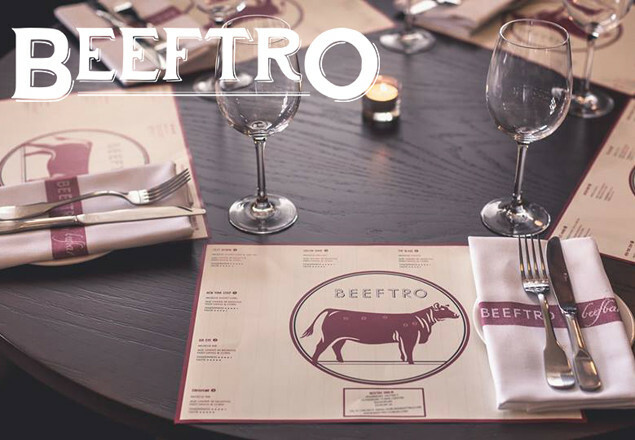 Beeftro is a retro 1930s style restaurant offering the finest in modern European cuisine. Apart from European dishes, this restaurant specializes in delicious cuts of beef, particularly mouth-watering steak, and they also serve everything from innovative chicken dishes to fresh fish. The beautiful interior setting of the restaurants is matched by superior service that will ensure that you have an incredible dining experience here. *For a supplement of €5 per person you can upgrade your set-menu steak to New York Striploin or Ribeye Steak. You must be over 18 to purchase this offer.